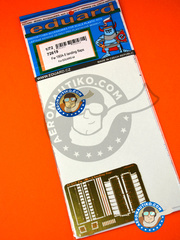 We can't be any happier, and we have it available for you at Aeronautiko!!!! Anaerobic cyanoacrylate glue, served in bottles of 21 grams. The real magic of this glue is that it dries when the parts are put together (similar to classic contact adhesives), so you can carefully and slowly handle and put them in place since the glue is not drying while handling. 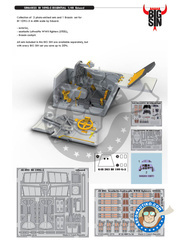 It works with pressure, which gives you the time to correctly position your assemblies. Assembly without the pressure of 2 surfaces. The pressure made (15 to 45 seconds) will guarantee a strong and precise adhesion. It's pure magic!!! 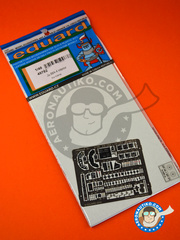 Photo-etched parts for detailing and improving Eduard's Focke-Wulf Fw 190 Würger. 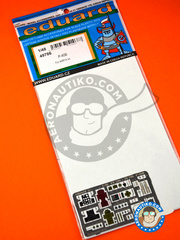 Set of photo-etched parts for detailing the flaps on the Eduard kit of the Fw 190 A-5. 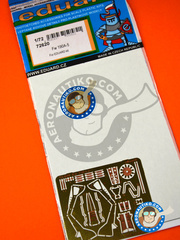 Photo-etched parts set for detailing and improving Airfix P-40B. 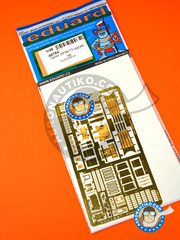 Who could be better than Eduard for designing the photo-etched parts sheet for the Harrier released by Eduard themselves? 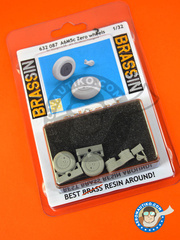 Do not hesitate, they are simply perfect for the kit. Awesome!! Eduard Brassin set of wheels for A6M5c Zero in 32nd scale by Hasegawa. 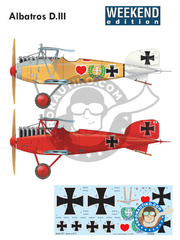 Set includes main wheels and tailwheel. This color has been included within the reference ZP-1455-1456. 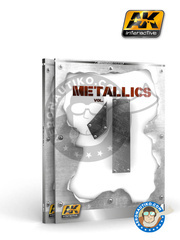 Not supplied separately. 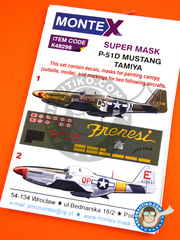 Weekend Edition kit including two plastic sprues and decals printed by Eduard for recreating two different versions. 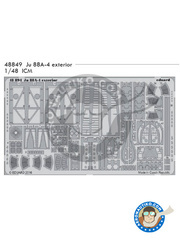 Set of photo-etched parts for cockpit and interior areas of the Ju-88 A4 by ICM. 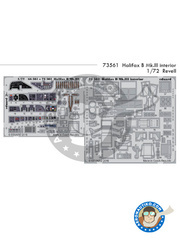 Brassin set of wheels for Republic P-47D in 32nd scale by Hasegawa. 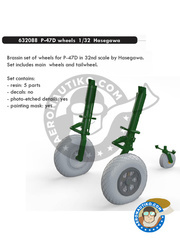 Set includes main wheels and tailwheel. 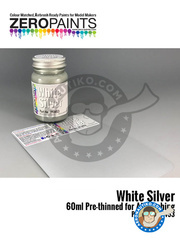 Bottle of 60ml prethinned "White silver" tone paint, ready for airbrush application. 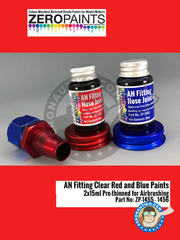 Acrylic adhesive specifically formulated for glueing polystyrene or ABS transparent parts, glass, canopies, headlamps, windows, ... Once dry , the appearance is transparent and the joint is slightly flexible. Bottle includes 59 ml of product. It is not toxic. Photo-etched parts for improving the whole interior of the Halifax. One of the two sheets is also printed in full color. 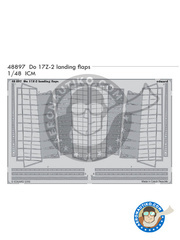 Photo-etched parts set for detailing and improving the looks the ICM Do 17Z-2 flaps. 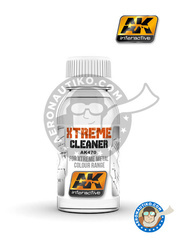 High quality cleaner for cleaning your brushes and airbrush after using it with any products, and specifically formulated for cleaning the Xtreme Metal range by AK interactive. 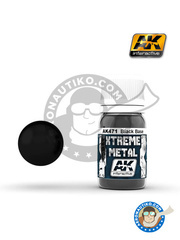 Glossy black base specifically formulated to serve as a base for the Xtreme metal metallic paint range by AK interactive. 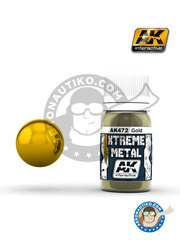 Gold tone paint from the Xtreme metal paint range by AK interactive. It is served in 30ml bottles and prethinned, ready for airbrush applications. 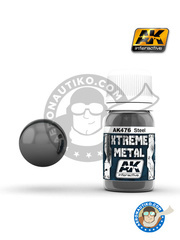 Steel tone paint from the Xtreme metal paint range by AK interactive. It is served in 30ml bottles and prethinned, ready for airbrush applications. 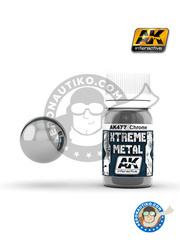 Chrome paint from the Xtreme metal paint range by AK interactive. It is served in 30ml bottles and prethinned, ready for airbrush applications.